Have you ever had one of those shopping days where you need some stationery, a gift for a kid’s birthday party, some coffee, a new hammer and a replacement piece for your china? Yeah, me too. Well if you live in Houston, you can get everything on that list with one stop at Bering’s Hardware (not in Houston? You can shop online too!). When we lived in Houston it was a favorite stop for us because they have the most amazing assortment of products for just about everything you need (and at this time of year, they have THE BEST Santa) and on my recent visit, I had the opportunity for a really fantastic store tour and to meet some buyers, sales associates and management. The holidays are nice because the theme is pretty much already selected, but why not make it your own by deciding on a color or colors to carry throughout your décor and tabletop?! It is an easy way to add ad an impactful look. Once you have decided on a color theme, you can purchase your paper goods, flowers and décor accordingly. From your stationery invitations, menus, place cards, holiday décor and possibly your party dress – express yourself with the color of your choice and we promise you will feel even more confident when guests arrive! If you are hosting a more formal get-together, then using your fine china is always a sure way to express a little extra holiday cheer! However, if you are a bit apprehensive and/or do not have enough pieces to cover the number of guests there are still plenty of options. Our happy hostess rule of thumb is to have a good time, and in doing so, your guests are much more likely to enjoy themselves too. 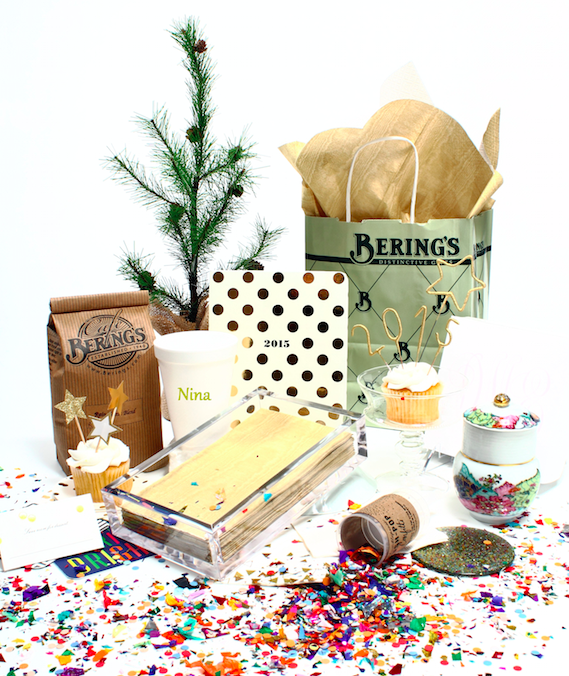 If festive Styrofoam cups, personalized paper beverage napkins and guest towels are more your style when it comes to hosting, then we guarantee you that you are not alone! Personalized paper goods are insanely fun this time of year and an added hostess perk is that Styrofoam cups prevent rings on your furniture! Should you decide to order personalized paper goods, be sure to allow for at least two weeks to receive them. If you are out of time, then not to worry! Solid colors, festive prints, a single initial and more options are all wonderful alternatives. Some of our Styrofoam cups and paper napkins have funny sayings that serve as perfect party icebreakers! Sayings such as, “Who invited all of these tacky people?” or “Festive Fuel” are just two of our off the shelf options. A little sense of humor is required, but most of your guests will probably find them funny! Fine china or Caspari’s finest paper goods, your guests will be sitting pretty either way! Having a consistent theme is the ticket and a unified color scheme incorporated throughout with pretty paper goods and décor is deceptively simple! Now that you have decided on your theme and the type of party, be sure to prep the area where guests will be placing their dishes! Leave plenty of space. This sometimes gets overlooked due to holiday décor. Be sure to make your life a little easier and set out as much as you can the morning of or the night before. An even better suggestion is to try and use cookware that is oven-to-table, such as Le Creuset. Regardless of the type of serving pieces you decide to use, place cards can also be used to label your dishes and can really add to the buffet table by providing a little more detail to tie your theme together. Anything you can do in advance will help to ensure that you enjoy the party too! Use a cute notepad to jot down a schedule of what needs to be made and when. Try to leave at least an hour before the party starts for any last minute emergencies, and, of course, to get ready and relax before your guests arrive! Last but not least, take note of four of our top last minute additions. Music, flowers, chilling some wine and lighting a candle in the powder bathroom are last minute-musts! 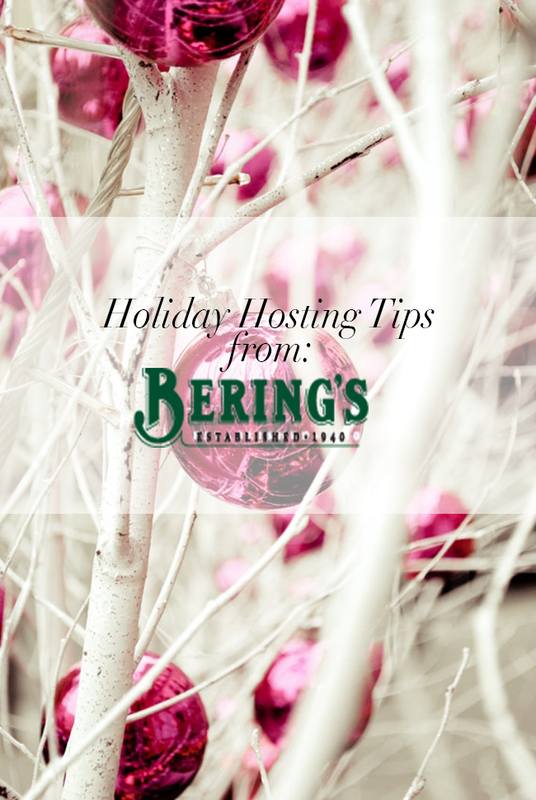 The right music, pretty flowers, a glass of wine and a simple candle are all little touches that add up to holiday hosting happiness! Mottahedeh Tobacco Leaf Heirluminare: Mottahedeh’s well known pattern is now available on a porcelain contained candle, perfect for adding just the right aroma to your house for guests, or to give as a hostess gift should you be staying multiple nights. Caspari Lucite Guest Towel Holder: A classically beautiful way to incorporate acrylic, that guests are sure to take note of! Caspari Golden Guest Towels: 15 triple-ply napkins to place in the acrylic holder for the host’s powder bathroom. Pretty darn awesome, right? I’m already super jealous of whoever wins this because I want every single thing for my own holiday entertaining. Per usual, enter on the Rafflecopter widget below. The giveaway closes at 5:00 PM Central time on Friday, December 12 and I will notify the winner by Monday, December 15. Good luck! Great tips! Hosting a holiday party in a couple of weeks and will def be following some of these tips. If you have any good Ugly Sweater Party ideas, send them my way! This is a great and helpful holiday post. I either give a candle or a bottle of wine to the hostess as a gift. how cute is this?! love me some holiday hostess help! Thanks for welcoming us to The HSS Feed and for letting us help with a guest blog post! Happy Holidays, Nina!! I love the idea of personalized napkins and cups! My favorite hostess gifts or yummy candles or wine! My favorite hostess gift is festive table linens. Candles, wine, or a basket of veggies from my garden! Love Berings! I got the cutest cover-up for my honeymoon swimsuit there (and registered there too of course :)! Oh- and my favorite hostess gift is a nice candle! I like to find cute or quirky dish towels that fit the theme as a gift for the dinner party host!